Form Description: Whether you are interested in coaching a youth league team, or your local high school team, you need to keep track of some rather vital player information. This Football Player Data Form can help you do exactly that. Not only will you be able to keep track of the player, but also their number, position, how long they have been at that position, and their general attitude. In addition, you will also be able to keep track of their contact information, and parent names. Definitely a huge help for any busy coach. 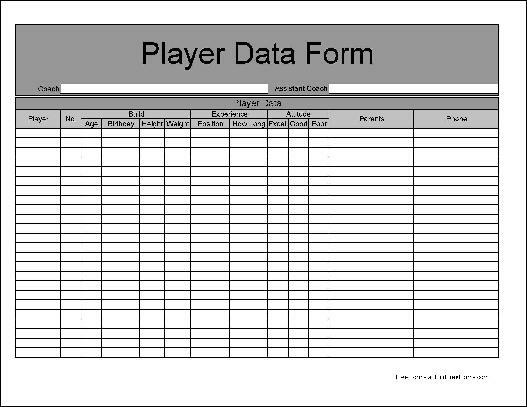 This form ("Basic Football Player Data Form") is associated with the following keywords: football, little league, youth, team, player, data, tracking, contact, information, basic.